I finished Julia’s Cabled Headband this morning, and had DD19 model it for a photo shoot before she left for work. The pattern is from Julia’s Cabled Headband by Pauline Chin. After we were done with the tree removal, we noticed another neighbor walking his dog, and flagged him down for a stop-over chat. He is still recovering from a terrible snowmobile accident last Jan, and is doing well. It was good to see him out and about, considering the alternative. CJ called to announce they have moved Teh Babeh Rhonda out of the Parental Bedroom and into her own ROOM! They painted and hung wall borders, got her furniture in place, and just have wall decorating left to do. Pictures will follow. 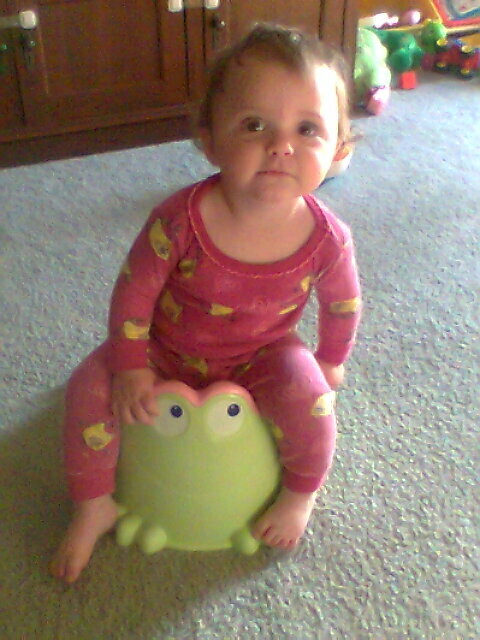 Miss Rhonda also got a new Froggy Potty this week, YAY!